3 and 4 axis with part capacity up to 81”x41”x32"
With our experienced machinists and the numerous CNC machines in our 5,354 square foot in-house machine shop, we have the ability to meet your specific machining needs and conveniently located in Vista (North County San Diego), CA. This allows us to deliver parts throughout Southern California. We have the capabilities and talent to machine close tolerance parts, while also having the man power and equipment to do large runs. 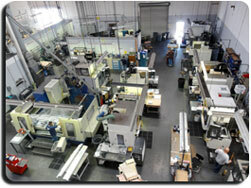 VIP even has a large capacity machine for large parts that require precision machining. In our in-house machine shop, we have everything under one roof to ensure quality machined parts! Although we have experience in working with numerous industries over the past 50 years, our existing customer base that utilizes our machining capabilities includes aerospace, defense, medical and close tolerance electronics. We are able to meet the most demanding expectations in today's manufacturing environment. Click on video below to learn more about our machining capabilites. Contact us to submit your RFQ today. Thank you!